Now, she is a self-confessed footy fanatic, breaking down cultural barriers and misconceptions. "It's my passion — it's an Australian game and I want to be part of Australia," she said. "They thought it was a little but weird, me playing in a hijab. "And it was like, 'no, I'm not', so they're used to it now." 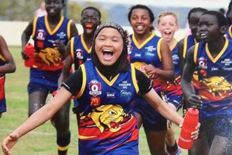 She is known as the 'Afghani Axe' and is one of dozens of refugee children in Toowoomba who have been drafted into an Aussie Rules program to help their integration into the community. Church pastor Ross Savill started the initiative after he noticed hundreds of new arrivals struggling to integrate. "I think a lot of these kids and families were just looking for something where they could connect with the broader community," he said. "I think it's broken down barriers both ways. "If you take Zimra for example, people watch this little girl run onto the field with a hijab on and they watch her play and enjoy the game, and they get to know her and her family. "I think all sorts of things happen when we get to know people as people, not as labels or as what we think they are." The program has had remarkable success and is now formally supported and encouraged by the AFL. AFL regional manager Keith Webb saw more advantages for the progression of the game. "We've got a lot of these refugee kids coming through that are naturally built for the game," he said. "They're tall, athletic, move well. "We've got quite a few of the boys and girls that are taking the next step through our representative pathways, getting identified by talent spotters, really trailblazing in that side of the game." Although still young, Zimra has been picked for representative duties, and the AFL predicts a long and successful future. "She's obviously very talented, she's someone who just lives and breathes the game," Mr Webb said. For the young girl, it is a future Zimra never could have dreamed of, though her sights are now firmly set. "I want to play in my future and I want to be professional," she said. "My favourite team is the Adelaide Crows — I like them because of Eddie Betts. "He's like a magician and my hero. I want to be just like him. "I just have to keep working hard — and I will."